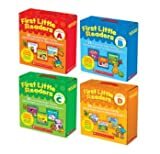 Learn to Read Set: 60 Beginning Reading Books for Kids, Preschool Kindergarten & First Grade with Bookmark. Leveled Readers - 3 Guided Reading Levels A,B,C. Little Leveled Readers: Level A - What Can I See? : Just the Right Level to Help Young Readers Soar!